1. I've been thinking about running today. There are several things I miss about running -- remind me that I miss running when I'm getting back into it and complaining every step of the way -- but today what I miss is is that whole-body-tired-muscles-wrung-out-but-in-a-good-way feeling. 2. Have I mentioned how much I love iced coffee in the summertime? Mmmm...hits the spot. 3. I'm waiting for some holds to come in at the library, so in the meantime I've been in the mood for a reread. Specifically Name of the Wind by Patrick Rothfuss. Have you read it? Fantastic. 4. Some lovely friends from church told me the other night that they want to play with Christina for an afternoon to give me a break. What a treat! I can't decide if I want to take a long nap, putter around the house alone, or go out and get a pedicure and maybe do a little solo shopping. I'm leaning toward the latter -- it's really hard to reach my feet these days. I remember reading a lot of good reviews of the book Me Before You, by Jojo Moyes when it came out a few years ago. Somehow, it never made it into my hands then, but when I came across the ebook on sale, I snatched it up. Over the weekend I finally started reading it...and could not put it down. It's engaging, extremely well-written, thought-provoking, funny, and very sad. Louisa (Lou) is a 26-year-old woman living in a small English town with her parents, her grandfather, her younger sister, and her sister's 5-year-old son. She has a boyfriend of six years and a job she loves at a cafe. It's a quiet life, but she's happy. Her life is shaken up when the cafe where she works closes. Job prospects in her small town are slim, and eventually comes down to a choice between pole dancing and becoming a caregiver/companion for a quadripelegic. Although neither is all that appealing, she takes the caregiver position. It's a six month assignment, and pays remarkably well. She shows up on her first day expecting an elderly client. Instead, she meets Will -- 35, beligerant, sarcastic, unhappy, and sometimes downright mean. She decides it's going to be a long six months. Will used to live a big life -- head of an international corporation, world-traveler, adventurer, lady-charmer. He worked hard and played hard, until one rainy morning he crosses the street and gets hit by a motorcyclist. In an instant, his life shrinks to the size on his chair, his small house, and his almost constant pain and discomfort. Will refuses to accept a life that's different, to move forward and make the best of things. He views his life as a prison, and one that will only get more painful and restrictive as time goes on. Will has decided that he has only one choice that is still his to make -- the choice to live or not. And after a failed personal attempt at suicide, he's made an agreement with his parents -- six months and they'll take him to a clinic that performs medically assisted suicides. Despite being so different, eventually the two hit it off. Lou is quirky, clever, bubbly, and transparent. She's one of the only people who Will feels treats him honestly, not walking on egg shells or making all of his choices for him. During their six months together, Will begins to open Lou's eyes to the world beyond their tiny town, and pushes her to go after what she wants, and not settle just because it's safe and comfortable. Lou brings light and laughter into Will's life, practically forcing him out of his house and reminding him that there's life beyond his four-walls. It's an unlikely relationship, but the two begin to care about each other very much. But life doesn't always have a happy ending, and Me Before You doesn't either. At least, not in one sense. Instead, like life, the ending is...complicated. This book deals with heavy, fairly controversial stuff. But it also has friendship and family and love. It's being made into a movie (which comes out this year or next) and the author is working on a sequel. Bottom line: it may not be everyone's cup of tea, but I thought this book was great. Rejoice! This list is not nearly so random as my last one. Me, hubby, and the one and a half kiddo live in Houston, Texas. Technically, we live in unincorporated Harris County, meaning we have no mayor/city council/town selectment/etc., and the county is our local government aside from the government-like Independent School Districts (which is what really defines the communities in the unincorporated areas of the county). So, we live in the Klein Independent School District, and our address is Spring. But to make it less confusing, just say we live in the Northwest Houston 'burbs. Hubby and I lived about five miles away from our current house for three years after we got married. Hubs grew up in the Klein area, but I was (and still am) a Missouri girl living in a Texas world. That said, I've come to appreciate a lot about my adopted state, and this gigantic, sprawling, mega-metropolis we call home. And as we've been back almost a year now, I'm starting to remember and re-aquaint myself with some of the things I like...and don't as much. 1. Diversity. Even out here in the 'burbs, there are a lot of people who don't look like me, or talk like me, or have the same background as I do. 2. Proximity to...a lot. There's a lot to do in Houston. A lot. Museums, NASA, concerts, theater, sports, the zoo, the Houston Livestock Show and Rodeo, cultural enrichment, shopping, eating. If you're up for a drive, Galvaston isn't too far away, and for us, Lake Conroe or Huntsville State Park are pretty close too. I'm the first to admit that I don't take advantage of it all, but I feel lucky to have it all at my fingertips. 3. Food. Maybe I want this to be it's own category because of the crazy pregnancy appetite, but the bottom line is if you can't find delicious food in the Houston area, then you just aren't trying hard enough. 4. Confidence. Houston is not a perfect place, by any stretch of the imagination. But Houston doesn't pretend to be anything it's not, and doesn't act like it's got anything to prove. In a lot of ways, that's refreshing. Sometimes problematic? Sure. But I like that kind of confidence but not arrogance is something I appreciate in people -- why not an environment that encourages it? 1. It's a swamp. Seriously. Houston's population didn't take off until the invention of air conditioning. This should be a red flag, people. The climate is sub-tropical. So basically, we're talking humidity and bugs. Sure, you can grow beautiful tropical plants and year-round produce. But seriously, so. many. bugs. And sweat. 2. Sprawl. Houston epitomizes U.S. tendency for urban sprawl. This tendency isn't entirely surprising if you think about it: the U.S. is huge. The national identity was formed by people seeking freedom and space and independence. There's space...why not use it, right? So, I get why so many U.S. cities are built/designed/evolve this way, but it's not my favorite. 3. Abysmal mass transit. This is closely related to point number 2. Closer to the center of town, I think the bus system is a bit more functional and practical. And a lot of people use the commuter buses around this area. But residents in the 'burbs just don't care about mass transit. They don't need it, and they don't want it, and they wouldn't use it. I think this is a little short-sighted and narrow-minded, but I'm in the minority here. 4. Pedestrian un-friendly. Again, closely related to sprawl and transit. Thankfully, our neighborhood itself is great -- sidewalks, trees, safe pedestrian access to the elementary school, neighborhood pool, community center, and park. But once you leave the neighborhood, you're going to need your vehicle. I understand why it's that way -- this has a lot to do with that whole unincorporated county thing, as well as the whole it's-hot-as-heck-out-here -- but I adore living places where I can walk or ride a bike to at least a few things like the pharmacy, grocery store, library, and maybe a restaurant or two. I will say that there is currently a really nice paved trail that is a little more than halfway done that runs along Spring Creek not to far from us. The trail currently runs connects a few parks, shopping centers, and a public library. Not ideal, but at least there are some active-minded folks around here! 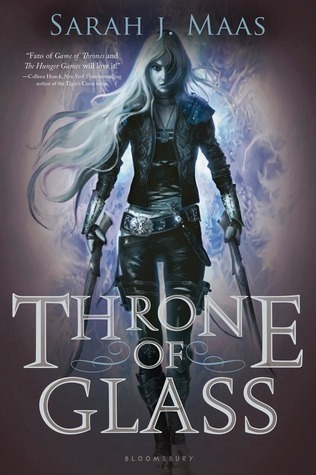 One of my very bookish (seriously, this guy reads like a book a day or something) friends recommended Throne of Glass by Sarah J. Maas quite a while back (the book is a few years old, after all), then hubby read it, and I finally got around to reading it this past week. This book is so much fun, y'all. It's action-adventure fantasy of the doesn't-take-itself-too-seriously variety: a cruel, possibly wicked king-turned-emperor, a gifted and snarky teenage girl assassin, a too-handsome-for-his-own good prince, a serious and honorable (and handsome, duh) captain of the guard, a competition among thugs, assassins and heavies, and forbidden magic. Celaena Sardothian, formerly the most famous and notorious assassin in Adarlin, was betrayed and sent to a prison camp where she is beaten and half-starved and nearly broken. Then the crown prince of Adarlin shows up offering her a deal: his father is holding a competition to choose a personal assassin -- a "King's Champion." If she competes as the prince's champion and wins, she will sign a contract with the king for four years, after which she will earn her freedom. It's an opportunity too good to pass up, although the competition and life in the glass castle don't really turn out quite as she expects. There are times when I had to roll my eyes at a bit of cheesiness, and a few times I wanted to slap the characters upside the head because WHY DON'T YOU SEE WHAT'S HAPPENING! There is a love triangle -- not my favorite kind of romantic plot device -- but it doesn't distract from the rest of the story, so it didn't really bother me. For me, the strength of the book is in it's fast-moving and fun plot, and in its characters. I love Celaena. I love that she's sarcastic and smart-mouthed. She's arrogant and full of herself, probably because she's the best at what she does and knows it. She's a bad-a$$ assassin, but also a teenage girl who loves clothes and luxury and shopping and looking pretty. Her heart yearns to fly free, but she keeps it caged up. This book is fun, although there is still plenty of blood and fighting and one or two legitimate monsters. Bottom line: solid action fantasy with a great main character.